You can apply effects to the titles as well. You can apply effects on In and Out of title clips. 1) In the folder view of the [Effect] palette, click the [TitleMixers] tree. 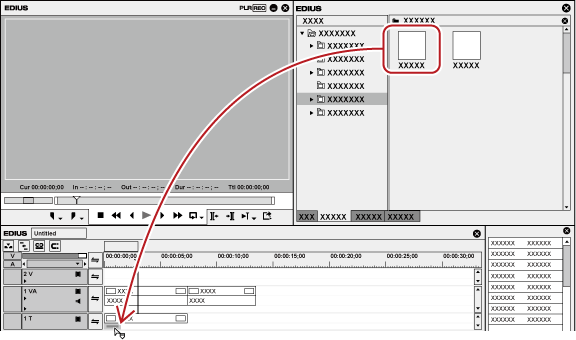 2) Drag and drop a title mixer onto the mixer area of the clip. A title mixer can be set individually on In and Out points. The timeline display changes as shown below. Check the title mixer details in the description in the property, or by trying to apply the effect. Select a mixer of the clip on the timeline. Select an effect in the [Effect] palette, and click [Add to Timeline]. Select a mixer of the clip on the timeline. Right-click an effect in the [Effect] palette, and click [Add to Timeline]. When placing the title clip, you can add the default title mixer automatically by setting at [Source] in [User Settings] → [Duration]. - You can change the length after placing on the timeline.